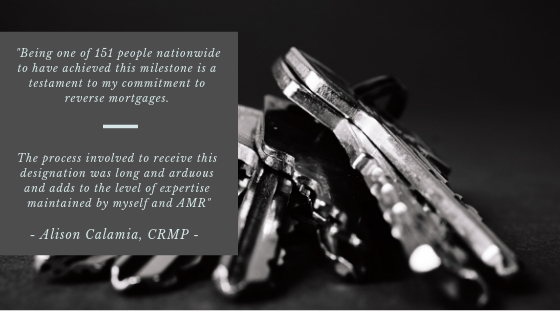 This January, our very own Alison Calamia joined an elite group of mortgage professionals who have achieved the highest designation of being a Certified Reverse Mortgage Specialist (CRMP) from the National Reverse Mortgage Lenders Association (NRMLS), making her 1 of only 151 CRMPs in entire the nation! That puts her in the top 1% of reverse mortgage lenders in America! 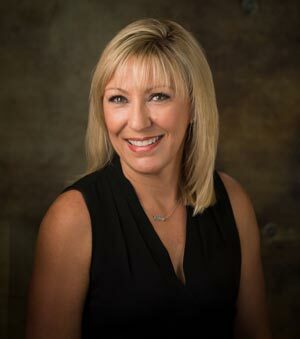 ALison earned this designation after passing a rigorous exam and background check, thereby demonstrating a competency in the area of reverse mortgages and a dedication to uphold the highest ethical and professional standards. Why Choose a Certified Reverse Mortgage Professional? A CRMP has the knowledge and experience that everyone who is looking into a reverse mortgage needs and deserves. Alison will listen carefully to individual’s needs to better understand their goals and assist in the sometimes difficult decision of whether a reverse mortgage is the right choice. When working with complex and powerful tools like reverse mortgages, it’s important to choose someone who is committed to these values and to the ultimate goal of providing individuals with the highest standard of reverse mortgage origination services. Alison has always been committed to education, experience, ethics, integrity, customer service, and quality. She is the epitome of what a CRMP should be and she will give you the confidence you need to make the best decision for your specific situation. Contact her at (504) 289- 6464 for a confidential meeting to discuss your scenario and see if a Reverse Mortgage is a right fit for you!